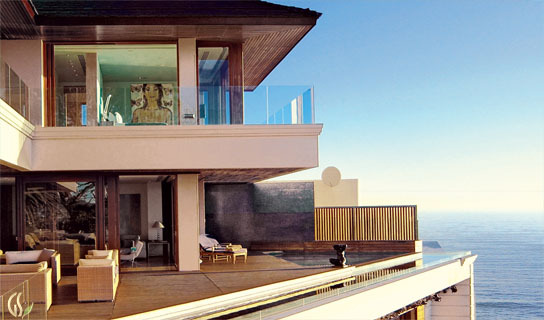 The tri-level Ellerman Villa is an aloof, exclusive extension of the original Ellerman House. This contemporary Villa offers expansive wrap-around ocean views with five (or, three) bedrooms and a dramatic “ship-style” deck with infinity pool. A romantic fantasy of being on your own ‘modern island’ above Bantry Bay. A Chic, private home. Experience Hollywood-style glamor with breathtaking ocean views – a true architectural delight to experience trendy Cape Town living in high-end Bantry Bay. Exclusive use of Ellerman House Villa One with a complete team of hosts to look after your entire stay and touring needs while in Cape Town. An exclusive, contemporary escape before or after your safari. Perfect for families or groups of friends. The Aqua room is the master bedroom of Villa One. Located on the top most floor. 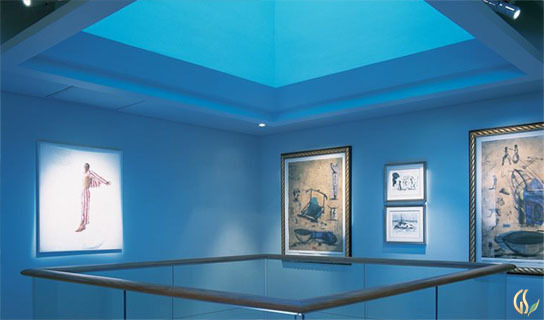 Take in the ebb and flow of the Atlantic ocean with clean lines to frame the nautical panorama and blur the boundaries of outside and inside space. The masterpiece bathroom completes the high glamor of the aquatic theme. On the second floor of the Ellerman Villa are the Lilac and Yellow guest rooms. Each room features a luxurious en suite bath. The Master and Second bedroom have ocean views, the third overlooks the Twelve Apostles mountain range with two single beds, suited for children or young adults sharing a room. Modern masterpieces of South African art in your private gallery connecting the levels. It all starts with a lavish breakfast, inclusive of your stay and properly customized to your taste. Enjoy meals in the privacy of your romantic suite or choose from an array of stunning settings around the grounds. 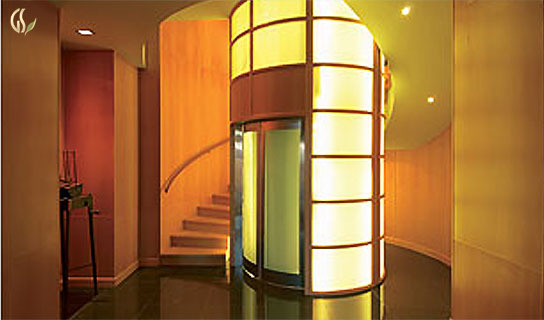 A private elevator within the villa for ease of access to all three levels, including spa. When taking up all 3 storeys, the Ellerman Villa one offers a total 5 bedrooms. The ground level houses the spa with two pool-garden level rooms. The Entire villa encompasses 692 square metres (7492 square feet). 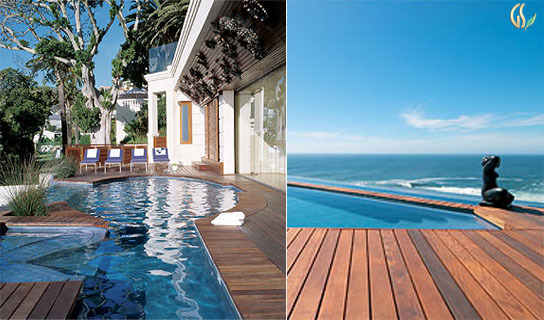 180-degree sea views with the Ellerman Spa’s free-form infinity pool and teak deck. Enjoy the adventurous architectural proportions of the villa with its relaxed outdoor spaces, always with a view of the Altantic. The decks are perfect place for breakfast or an extraordinary sunset barbeque with private chef. 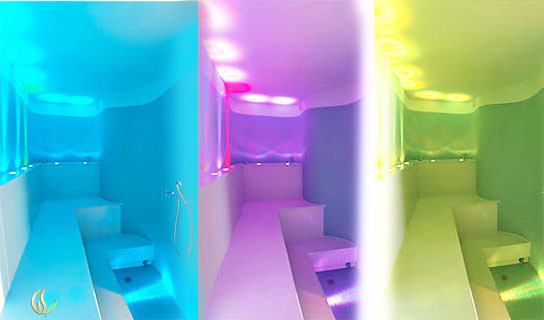 The spa features a lounge with infinity pool overlookign the sea, and a color therapy steam room. The Spa area is on the lower floor with a private access door. If taking up this floor, with its 2 bedrooms, the spa is exclusively yours. Planning an escape to Cape Town? Check out our Luxury Cape & Safari Packages. See all of Africa’s Big Game! to tailor your private journey to Cape Town.